A server in your closet? ServerCube is building the world's largest decentralized cloud computing platform. 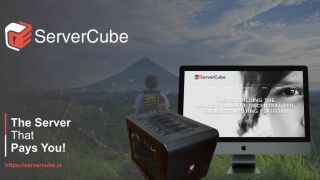 Instead of keeping servers in a single centralized location, ServerCube's devices are distributed and provide a revenue stream for hosts that include libraries, schools, households, and small businesses around the world. Hosts provide the location and the internet connection, and ServerCube provides utilities subsidies, solar, and/or WiFi (depending on the market). We have to walk a fine line - our devices need to be powerful enough to generate meaningful revenue for our hosts and the company while still being unobtrusive. It's not a perfect comparison, but it's pretty apt. Unlike an Airbnb guest, ServerCube will never leave hair in your shower or spill wine on your carpet. Like Airbnb, however, ServerCube is a great way to use technology to monetize extra space. ServerCube makes it extremely easy to start hosting - especially when compared to Airbnb. Successful Airbnb hosts often make a significant investment to prepare a space for their guests. Furniture, security cameras, locks, and cleaning expenses are all examples of the kinds of investments a host might have to make. ServerCube hosts, by comparison, do not have to pay for their devices and can begin monetizing them as soon as they are installed. As for the cost of growing ServerCube, there is no doubt that placing devices with hosts will require an up-front investment on the part of the company. Once installed, however, the devices average 95% up time and pay themselves off very quickly. This means that, by consistently reinvesting the profits from a relatively small initial pool of devices, we can exponentially increase the number of ServerCube devices in the field. Financially, it's a very sound growth plan. Additionally, because our business model relies on our devices being a discreet revenue source for hosts, they are very unobtrusive. They are intended to run quietly in out-of-the-way areas like basements and spare closets - places where they are unlikely to be in open view of would-be thieves. Becoming a host is sort of a no-brainer. It's free, and you'll either get utilities subsidies (in the US) or solar panels and/or WiFi (in Turkey and India) in exchange for keeping a device plugged in and connected to the internet. If I walked in to Intel and handed my IP and my business plan to the appropriate director, I doubt I would ever hear another word about it. They already have a cash cow - why would they cannibalize it to try something so radically new? It's very possible that Intel is Kodak, and swarm computing is the digital camera. No one else is taking an organized approach to distributing and democratizing high performance computational capacity. Our model is the only one that rewards hosts - even hosts with no real technical background - for allowing us to put a little piece of our swarm computing network in their spare closet. It an extremely efficient model - we don't have to build or maintain massive and inefficient facilities, and we can pass that savings along to our customers. Nobody is contesting that there's plenty of demand for computational capacity, and we intend to do well for ourselves and our investors by providing it. But we're also doing good. We're bringing solar power to the developing world while subsidizing essential institutions in the US - libraries, museums, schools, and even individual households. We don't expect to take the data center market from Google, Microsoft and Amazon anytime soon, but we do believe that there is room for a new kind of data center. We believe that our model provides a radical alternative that can help to service this rapidly growing market, and we believe it needs to be developed.